The broadcast of Heart and Greed <溏心風暴3> has brought the public’s interest back on Michael Tong (唐文龍), including his love life too. In a recent radio interview, the Heart and Greed actor was asked to talk about his former relationships, which he rarely did in the past. 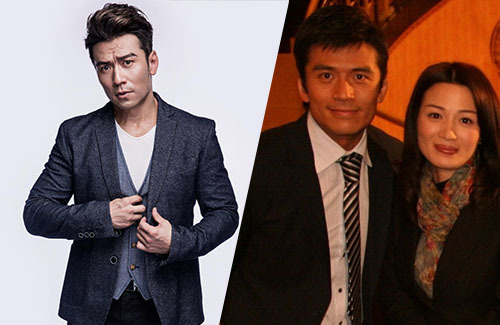 The insanely private 48-year-old actor then broke the silence on the reason behind breaking up with Cherie Chan (陳少霞), an ex-TVB actress who is perhaps best known for her role as Yue Lingshan in TVB’s 1996 adaptation of The Smiling, Proud Wanderer <笑傲江湖>. Michael and Cherie started dating soon after Michael made his debut in the industry, and their relationship lasted for six years. Michael and Cherie never revealed why they broke up, and it isn’t a surprise to see why they didn’t. Michael also talked about another ex-girlfriend—a flight attendant he dated for seven years before breaking up in 2006. Michael explained that he broke up with her because he didn’t want to get in the way of her future. when it comes to fielding questions with PC responses, he tends to not hold back and goes for the kill. a little too genuine & rough around the edges for most HKers. as to his situation with Cherie… i had no idea they even dated. and that’s a douchey reason to break up with her, although i’m sympathetic to his rationale.. i wonder if she knew. she must’ve felt like she was bad luck. well, no matter. she’s now married to a millionaire and it’s no bad luck to him. don’t think michael should’ve brought this up at all. Apparently, this is her 2nd millionaire husband. The 1st 1 went bankrupted and they divorced. She also betrayed Andy Lau not sure of the reason. But it indicate that she is not very simple. When he said he owe his gf, i think it is only the 2nd 1 not Cherie. His breakup with Cherie seems mutual. @1nit I think it was after her first ex that she and Michael Tong dated… I’m not sure what the exact timeline looks like. In any case, him bringing this up now when she just got married in 2016, isn’t helping her at all. It’s to generate publicity for himself. I’m not a fan of superstitious accusations. They dated before she got married to her 1st millionaire husband. She quit show biz after she married and migranted. Came back few years ago because of divorce. And found herself another 1. To be honest, the break up was mutual. He didn’t say bad things about her. Nothing wrong with mentioning breakup reason when your not back stabbing anyone. It just show He isn’t smart with the way he deals with the press and thats the reason why he isn’t famous. She might be the 1 that initiate the breakup since her parents was suffering too. Glad that Cherie Chan is doing well by marrying a millionaire. @kk12345 Looks like a father ? haha LOL…OH well, $$$$$$$ talks. I never find her acting good or her attractive in any way. Didn’t even know she dated this young above. Michael also talked about another ex-girlfriend—a flight attended he dated for seven years before breaking up in 2006. Michael explained that he broke up with her because he didn’t want to get in the way of her future. if he didn’t want to waste her youth, why date for 7 years? that’s a long time. We should give him some slack. This is probably the first ‘in depth’ interview he had gotten since debut so let him talk and have his 15 mins fame-ish. Sure he used her name as a boost. But like @1nit said, he didn’t slander her so no foul. If anything, this sheds bad light on him. He sounds like he’s very afraid of commitment, like one of those who eats but doesn’t wipe his mouth.